This zone offense is a structured motion which is highly effective against odd front Zone defenses. Through this offense we can take full advantage of the 3-point shots and to get the ball comfortably to the post players in the scoring position. It is a simple offense which can be taught easily. In this Offense lot of skip passes are made which create gaps in zone and the defensives players have to do a lot of adjustments which gets the shooter go for a open 3 pointer. # 1 passes the ball to # 2 and cuts to ball side corner. 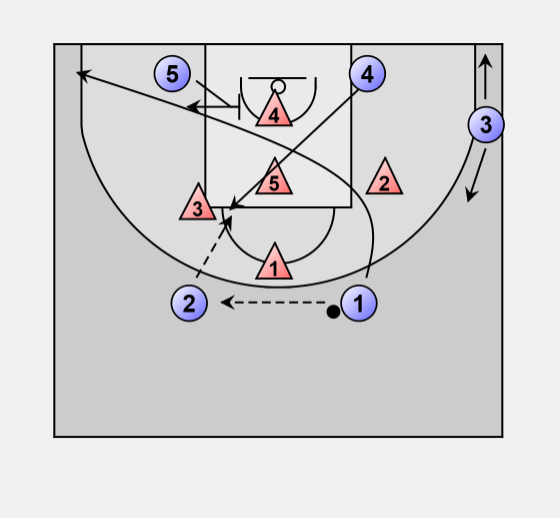 # 5 sets a screen into the middle for # 4 flashing to ball side elbow and sets back to the Low post area. # 2 passes the ball to # 4 at the high post. If # 4 hits # 1, # 5 clears the lane and cuts to the other block. # 4 will go for strong cut to the basket expecting a pass from # 1. • He can look for a lob pass from # 3 off # 5's back screen. • # 4 can cut directly to the ball side block. # 5 comes to the ball side elbow. # 3 if open can go for 3-point shot otherwise dribbles to the corner to attract the defensive player on him so as to give an easy pass to # 4. • Do not rush for Jump Shot. Attack the zone in and dish the ball out to the open shooter. • Screen the Zone and use Skip passes to open shooter. • Dribble less and pass more against Zone, as it will take the thinking time away from the defensive players. • REBOUND! REBOUND!, whenever a shot is attempted, attack the board because you can rebound better against a zone.